The Atlases of the world are surprisingly unseen, yet they grow our crops, support our farmers and make our meat, dairy and grain into meals. Which is why Terra Firma came about. Neither strictly a publication nor a marketing company, we are a new type of media company that writes stories about businesses involved in production and consumption: co-ops, farms, agronomists, animal feed and nutrition companies, as well as businesses in the beverage, retail and food preparation sectors. Then, we share these stories online, through social media and our blog, with the dual purpose of seeding new ideas and promoting the companies that are most often the focus of these stories. While conventional media covers these same industries from time to time, they represent the standpoint of consumers. 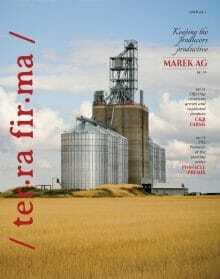 Terra Firma represents the often unspoken perspective of the industry—nationwide. Launched in early 2017, Terra Firma has the backing of Trueline and its vibrant staff. The Portland, Maine-based business is known for being one of the best places to work in the state, and it is the umbrella company for numerous award-winning publications on wide-ranging topics. For permissions of any Terra Firma content, contact Blake Davis.